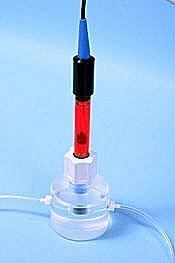 Micro flow ion electrodes have internal volumes of less than 50 ul for flow through applications in biotechnology, chemical research, pharmacology, organ perfusion studies, HPLC, FIA, and environmental studies. Low Volume Flow Through Systems. All flow through ion electrodes have internal volumes less than 50 microliters. Low Detection Limit. Micro flow through ion electrodes will typically measure below 1 ppm, while some ion electrodes like the sodium electrode will measure down to 0.02 ppm (1 micro Molar). Use chart recorder or PC for continuous recording of concentration vs. time. The recorder output from the pH/mV meter which is used with the ion electrodes can be input into a standard strip chart recorder or PC with an A to D converter. Autoclavable. Autoclavable micro flow through electrodes are available at extra cost. Specify when ordering. All micro flow through ion selective electrodes in the table below are combination electrodes where the reference electrode is already included within the body of the micro flow through ion selective electrode. Best buy! Complete micro ion measurement systems measure, log & graph all in one! See ion systems index for features and advantages of our complete ion systems.